The Wisconsin Comprehensive Cancer Control Plan (WI CCC Plan) 2015-2020 is a common framework for action in cancer prevention and control to be implemented over five years. 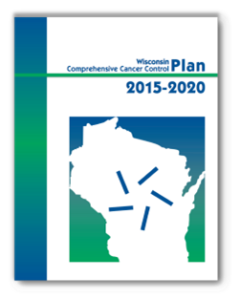 The WI CCC Plan 2015-2020 is designed to provide program leaders, policy makers and researchers with a carefully crafted vision of what needs to be done and the resources needed to reduce the burden of cancer in Wisconsin. VISION: A healthier Wisconsin by reducing the impact of cancer. implement and promote a statewide comprehensive approach to cancer control. The WI CCC Plan 2015-2020, the 3rd five year plan for Wisconsin, was updated by almost 150 partners across the state which included advocates, nurses, physicians, public health professionals, researchers, social workers, survivors and more. These partners represented the Wisconsin Cancer Council member organizations throughout Wisconsin that are dedicated to reducing the burden of cancer in the state. This update process occurred over the course of one year from May 2014 to June 2015. It is illustrated below.